Elsewhere the Battlefield: Bad Company 2 and Killzone 3 clan thread started by fanpages continues to buzz with over 20k comments (admittedly not all on-topic). If you want to join a clan or find other HUKD members playing this is the thread to hit up. We play a wide variety of other titles such as "Blur", "Burnout Paradise", "Gears of War 3", "Massive Action Game" [MAG], "Tom Clancy's Rainbow Six: Vegas 2", "Uncharted 2: Among Thieves", "Uncharted 3: Drake's Deception", "Warhawk, & "Starhawk". Suggestions for further titles to consider very welcome, although please note that we do *NOT* actively play any "Call of Duty" series titles on a frequent basis. If you are interested in this franchise, please visit the thread mentioned in comment #1. Another year... another recruitment drive. This time for "Killzone 3". PlayStation 3 players only this time, though, sorry. A number of HotUKDeals.com members have expressed interest in starting a "clan" ("squad") for the new first-person shooter video game developed by EA Digital Illusions CE [DICE] (& published by Electronic Arts) for Microsoft Windows, PS3, and Xbox 360 platforms, "Battlefield: Bad Company 2". Officially released in Europe at the end of this week (& already on sale in North American territories), the game is a direct sequel to the previously available "Battlefield: Bad Company". This "Misc" thread is to collate the details of all those members who wish to play online & to record their platform of choice, their user name (PlayStation Network Id, Xbox 360 GamerTag, PC Screen Name), the days/times available to play, & to initially organise into one or more clans for each platform as required. Subject to interest, & if the posts become too unwieldy to maintain, we may have to break-off into dedicated PS3, Xbox 360, & PC threads, but for now please add what you have to play on & when you are able to play. Please also add information about which in-game solider Class you would prefer to play (so we can balance squads with choices of "Medic", "Assault", "Engineer", &/or "Recon" [sniper]). We need not seek officially matches against other (probably more-organised) clans initially but if we just swap log-on details so that we can communicate online & invite each other to games we are participating within then games will be easier to find & we can get to know each other's strengths & weaknesses... but most of all having fun playing alongside (or against) other HotUKDeals members. Anybody who has pre-ordered the title may well have received their order already. If you have & wish to brag by posting a "Got mine" type comment, please do so (as it will 'bump' this thread back up to the top of the first page of recent discussions & may attract more members to enlist for duty). If you wish to contact any of the players listed below, &/or exchange "Friend" requests on the platform of choice, please refer to HotUKDeals & include your own HotUKDeals member name in the accompanying message rather than simply sending a blank request (that may be deleted without confirming the "Friend" addition). Thank you. + other players from my [TSR] (Three Speech Regulars) "Killzone 2" clan. ...Mobile Factory, a Guerrilla Warfare map for 16 players set aboard one of the largest vehicles from the single player campaign. Part resource production facility, part moving fortress, the Mobile Factory is a strategic asset that both factions desperately want to seize control of. Combatants need to watch their step as a single mistake can cause them to plummet into the heavy duty scrap metal shredders at the bottom of the facility. Those looking to do some shredding of their own will be able to wield one of two portable miniguns found in the Mobile Factory. DLC Pack 3 “From The Ashes” will be available from the PlayStation Store on 22nd of June for €4.99\£3.99. But that’s not all! Those of you new to Killzone 3 will be interested to learn that we’re simultaneously releasing the DLC Bundle Pack. As the name implies, this pack bundles the Retro Pack, the Steel Rain Pack AND the From The Ashes Pack – a total of eight maps – for the low, low price of just €9.99\£7.99. . Stay tuned to Killzone.com and the official PlayStation.Blog on Monday, because we’ll be posting preview videos of the other two maps in the From the Ashes Pack. You gain additional points for killstreaks (at the end of the round/match). Grants a 25% damage increase for all bullet weapons. Explosives are not affected. Reduces reload times for primary weapons (to about half the time taken without the ribbon). "From the hip" (non-sight/scoped aiming) is more accurate for all primary weapons. Doubles the amount of experience points gained for kills, & assists. Faster Aim (Earned by gaining ten kills whilst aiming down the sight/scope) - Lasts all match. Reduces the time taken to sight a weapon (to about half the time taken without the ribbon). You do not gain spy planes that show the enemy on your radar, helicopters with mounted gatling guns, cruise missiles, "rolling thunder" bombing raids, dogs that run at you, or any other kind of weaponry. Useful References for "Battlefield: Bad Company 2"
"good map overview, showing game modes for each map too (note the Part Valdez conquest mode, which has not yet been announced - probably part of Map Pack 4?)" "the website for the Hotukdeals Battlefield bad company 2 Clan"
Favoured Class(es): Mainly Engineer, but sometimes Sniper for when the time is right. Mix of Assault, Engineer and Sniper, it's all good fun! 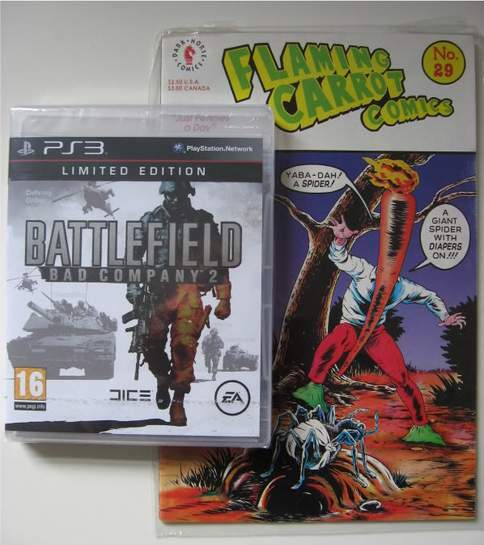 Sweet - flamingcarrot + BC2 = WIN! Two of the same (err... two games, not game + comic, of course) delivered just a minute ago here. Just woke up from nights and mine is in the kitchen! Good times! I'm still waiting for a price drop or payday. Day/Dates/Times available or unavailable: Shift-worker so varies. On the lookout for a nice shop owner to sell me an early copy..
Got my name for PC version - Retro89 - Just played through Singleplayer and loved it. There are a few bugs e.g. when i stabbed the first guy in the first mission his body went flying lol. Thanks for all of the responses so far.I have added "rep" to each of you … Thanks for all of the responses so far.I have added "rep" to each of you as a 'thank you' for your support.PS3 players ("fanpages", "Firmsky", "flamingcarrot", "tony_dudz", "madeofstars"): I have just sent each of you (apart from myself, of course, & "flamingcarrot", who was already in my "Friends List") a "Friend Request" via the PS3 XrossMediaBar so we can meet-up & invite each other to games in an easy manner than hoping we turn up online at the same time. You may also like to do the same so that everybody is in your own “Friends List” too. Xbox 360 players: May I suggest you also do something similar either by the LIVE.Xbox.com site, or within the console's Dashboard interface? Hopefully we can find another interested party to make up a squad of four for you.PC players: Still only two of you... so we could really do with some more numbers but you can still look out for each other's Screen Names whilst playing in the meantime.As the game is officially released in the UK tomorrow we may well find more people enlist over the coming weekend, so please keep subscribed to this thread & once we have played a few (hundred) games between ourselves we can start to challenge other teams to tournaments & matches (if you wish to).Although, like I said initially, this thread is really just to swap user names on our consoles of choice in order to have fun. Please don’t think there is any pressure to compete.Good luck out there & please report back on your own battles with hints & tips for playing each map if you have the opportunity.Thanks again.BFN,fp. I'll be on today and accept your request. Thanks for setting this up FP! This all depends on when I buy the game...could be a while...if at all! Second great BF moment - Apache helicopter wreaking all kind of havok on Port Valdez. One shot from my RPG, drifts up slowly, drops a bit and bam! Chopper and three guys are history. I NEVER manage to hit the choppers with an unguided RPG, so that one was very sweet indeed. Spot all the time - not only do you score a shedload of points, you help out all your team-mates. Don't stay in one place for too long - no place for campers here, too many people to spot you, and far too many ways to die if you stay still! haven't used them all yet! Received my copy today so will confirm later today my ID. Only really played as engineer so far (sadly had to work today, so no chance to experiment :x), as that was my preferred choice on the older PC battlefield games. Hope to see some of you online & will send out some requests tonight. I think that is indicative of the MW2 crew moving over to the game at the … I think that is indicative of the MW2 crew moving over to the game at the moment, thinking of their K:D ratio, and not trying to win the game. The number of people standing around doing nothing, whilst a crate needs disarming never ceases to amaze me. If you get a decent squad of 4 though, or even just 2 or 3, who actually move on the crates/targets, no amount of snipers are going to stop you (imho).I will admit they are a pain, but you can usually work out where they are ('sniper hills'), and if you keep some cover between them and you, their sniping is pretty worthless. If you see one, remember to 'spot' them (select button) which will reveal their location to all your team-mates, and means they won't be there much longer! That's not a bad idea. Shame that people can't use their common sense though, and see that there already enough snipers on the battlefield without needing their input. Unfortunately I can't guarantee to be on at certain days/times as the missus may be hogging the TV, or she has not gone to bed yet. Although you could always message me to see if I will be available at a certain times/dates. XBOX - Most weekdays after 10pm and some weekends. Bit of anything, although my favoured would be Engineer or Recon. Sorry to be a noob, but how do you do this on the xbox 360 version? I.E. what buttons do you need to push. Sorry to be a noob, but how do you do this on the xbox 360 version? I.E. … Sorry to be a noob, but how do you do this on the xbox 360 version? I.E. what buttons do you need to push. any body wana play now? It'll depend on the map. F.A.O. flamingcarrot, that spotting tip you told me about is a god send :thumbsup: I can't help but spot anyone and everything now lol. Even if they are at close quarters, I'm like do I spot or shoot lol. Game purchase and had a quick blast Friday night before heading away for the weekend. Has the HDUK clan been set up for the 360 yet??? Anyone fancy quick bast tonight??? Lol, you can't be any worse than I am, Im on a K/D ratio of 0.76 currently, that's roughly after 6-7 hours online time. I'm not too bothered about it. It's one of those games that you can jump straight into and enjoy, so I wouldn't worry to much about how good or bad you will be. As long as your enjoying the game and having fun what more could you ask for. I would agree that K:D ratio is not really important in this game (although it is nice to maintain a decent one still). More important are things like reviving/healing team-mates, spotting enemies, fixing stuff, and resupplying your squad/team, and just generally having a blast!